India is home for the cotton crop. It is known as the pearl of Indian textiles with its cool appearance and soft, light feel. It is a natural fibre of vegetable origin, like linen, jute or hemp. The art of weaving and dyeing of cotton had been known in India since 5000 years and has found mention in the epics. It was an export commodity even during very early times. The export of cottontextiles have been steadily increasing over the years. 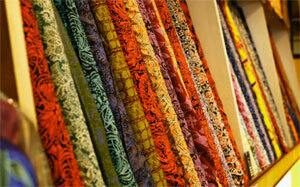 There are 23 different varieties of cottons found in India and thousands of cotton weaving centres. Cotton is used in producing a wide range of items like saris, salwars, bed sheets, covers, napkins, shirts, summer wear, tablemats etc. The traditional Indian cotton weaving revolves around 'Khadi'. Khadi is a cloth woven by hand using handspun yarn only. Fine cotton fabrics are also referred as Muslin. 'Mulmul khas', the royal muslin is the fabled and most famous cotton weave. Cotton fabrics are more popular among the people of India. The brilliance of cotton is visible in a variety of weaves in their traditional weaving patterns in the different states of India. Among elaborate styles in cotton, 'jamdani' of West Bengal- the light weight cottons in delicate and subtle patterns is one of the best known traditional cotton fabric. Jamdani (inlay) technique was also developed at Tanda in Uttar Pradesh. West bengal is also famous for their Tangail cottons and Daccai sarees woven by weavers who migrated from Bangladesh. Jamdani (inlay) technique of patterning is found in most cotton producing centres like Venkatagiri in Andhra Pradesh , Morangfi in Manipur and Kodialkaruppar in Tamil Nadu. The fabulous 'Venkatgiri' sarees of Andhra Pradesh, are known for its gold designs in offwhite body colour. Andhra Pradesh is also known for Ponduru Khadi, which is obtained from wild variety of cotton and Upadha Jamdhani sarees. It is used in shirting and furnishings. Madhya Pradesh is famous for its delicate weaves in Paithani Technique such as Chanderi cotton and Maheshwari sarees. Rajasthan is known for Kota doria sarees which is woven in a small district named Kota. Chickan work in cotton sarees is a traditional embroidery style from Lucknow. Also popular are the cotton check lengths of Mamallapuram in Tamilnadu, used as 'lungis' or sarongs by men. Kerala has special Karalkkudi sarees of unbleached cotton with rich broad gold borders and pallus. The tribal regions of Madhya Pradesh are also known for their cotton saris or Gamchhas. These saris come in a variety of colours and traditional motifs inspired by nature.